Every contract cycle workers have to fight to keep the benefits we have earned. We are always on the defense, but now workers across the country are starting to fight back. Teachers, fast-food workers, and many more are bringing back the strike in order to defend their wages and benefits, but also to win more. 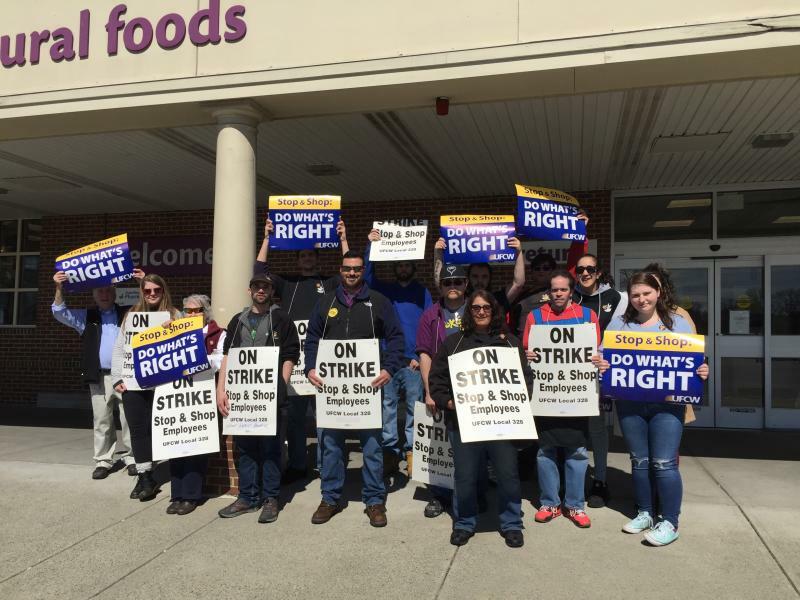 On Thursday, 31,000 supermarket workers at Stop and Shop across New England followed suit, going on strike for the first time since 1988. Stop and Shop is owned by a major multinational corporation called Ahold Delhaize. In the U.S., they are the 11th biggest retail corporation and the third biggest grocer, owning many of the major grocery outlets on the East Coast, including Hannaford and Food Lion. Last year Ahold Delhaize made over $2 billion in profits. Workers are striking in reaction to a number of attacks the company is pushing in contract negotiations. Stop and Shop is trying to raise health care costs by up to 500 percent – for some that means increases from $13 to $100 per week – eliminate time-and-a-half pay on Sundays and holidays, kill the pension system and turn it into a 401k, cut paid vacation time, and institute a wage cap for all employees. Meanwhile, top executives are making more and more money each year. Strong Picket Lines and Community Support – Fight to Win! Working people everywhere should support this strike. If Stop and Shop is able to defeat the strike it will give confidence to other big corporations to make similar attacks on workers everywhere. If workers organize strong picket lines and the wider labor movement mobilizes in active support the company’s attacks can be stopped. Other unions should pledge – like the Teamsters – to not cross the picket line. This would mean not providing any services intended to keep a store open, such as deliveries or utility repairs, as well as spreading the word to their members to not cross as customers, like the Massachusetts Nurses Association has. Socialist Alternative members will be on the picket lines every day helping to keep up the energy and maintain strong picket lines. Picketers should actively try to stop customers from entering the store by getting into conversations about what’s at stake and why they should shop elsewhere. Picket lines will be most effective if they are done as close to the store entrance as possible. Also, it would give the strike a critical boost if UFCW organized rallies outside of the stores, encouraging customers and the public to participate in solidarity. Other unions should turn out in force to these rallies too. Workers are strongest when we stand together! In discussions on the picket lines, many workers are upset over how long it took union leaders to call the strike. This strike could be used as a jumping off point to build UFCW into a more democratic union with full rank-and-file engagement and involvement. This would put the union in a stronger position to most effectively stop future attacks by the company and win gains. Going forward, union reps making more frequent visits to stores to keep members up to date and involved, as well as more frequent union membership meetings, would help this process. And all elected union officials should receive the average wage of the workers they represent to ensure they are accountable to union members and their interests. Winning this sort of change will require rank-and-file pressure and organizing. From teachers to grocery workers, the labor movement in the U.S. is in the early stages of a rebirth. If Stop and Shop workers win this strike, it will be a powerful demonstration of the ability of workers – when faced with blatant attacks by the boss – to fight back and win. But a victory is not guaranteed. Workers and supporters must maintain strong picket lines to maximize the company’s loss of profit, and the union leadership needs to stand strong at the bargaining table. All out to win this strike! Out of this strike: Build a more democratic and fighting union with full rank-and-file involvement to defend against further attacks and go on the offensive.